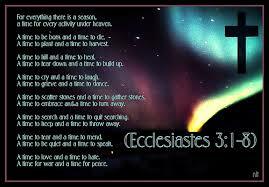 Ecclesiastes 3:1-8 gives us a disciplined melody of what will be in our life. Those scripture make it perfectly clear that there is a time for everything we go through and that time is directed and chosen by God. We all have times when we recognize that God is calling us to a necessary ending so that we may seize something new. When God gives those sometimes difficult directions we can say, Ok God, I am in, I know you are leading this expedition and I trust you therefore I am on board, let’s go. Or as happens often we can say, sorry God, this is not my idea, I will ride this one out, catch me next time round. It is important to remember that sometimes we must let go and move on from those familiar things which we cling to so tightly, to embrace all that God has for us. Oftentimes the things we hold onto so hard are not God’s best for us but we don’t see that. It is only by making the choice to let those things go that we can inherit the new beginning that God has for us. It is true that there is a time to depart even when you cannot clearly see the next step. No one said it would be easy. That is tough to accept when what you have lost is your dream or when what you have lost has become more important to you than the one who made it possible in the first place. Put another way, when things are not going our way we love to grab hold of the wheel of our life and not let go, thinking we can steer ourselves into calmer waters, in effect telling God we don’t trust Him. The journey of faith calls us to trust God no matter what season of our life we are facing. If we obey and trust God He will lead us where we need to be. The great thing is we can be assured that He will be waiting for us when we arrive.